Brown dress and hairstyle give off an old time feel. 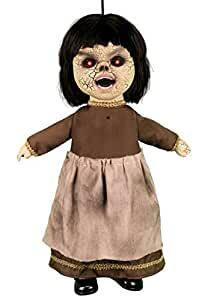 The Doll of Your Nightmares. You won’t want to tuck yourself in with this creepy Totally Ghoul Coffin Doll with Brown Dress Halloween Decoration. Hang it somewhere unexpected or sit her down in a chair, where friends and family will be startled by those red, demonic eyes. Her short, black hair style will also leave you feeling haunted.